I'm finally back with my first card for June! After not crafting for over a week, I found myself a little out of practice when I sat down to make this card, so I decided to ease into it and make a simple card. I used Amber's 2nd Viva La Verve sketch for June, VLVJun02, for my Anniversary Wishes card. The "twist" was to use something new. My something new is both new product and a new "handkrafted" embellishment. While we were in MN, I had a chance to visit an Archiver's store for the very first time! I found this beautiful K & Company patterned paper, which I used on my card. And I used the fabulous tutorial by Nichole to make my crochet flower. 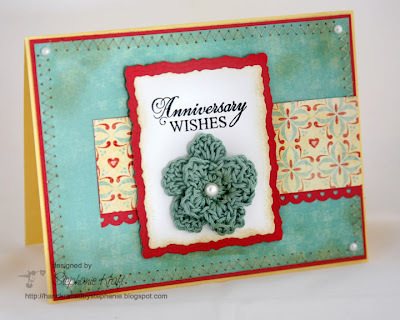 Accessories: Deckled Rectangles Nestabilities (Spellbinders), Cuttlebug (Provo Craft), Tiny heart border punch (Martha Stewart), Pearls (Kaisercraft), Embroidery Floss (DMC), Crochet hook, Foam tape, Thread, Sewing machine. So pretty! I love that aqua color.